The bike in question was also a Yamaha, a distant ancestor of the M1—the TZ750. During its heyday, the 750cc four-cylinder two-stroke had a reputation for being vicious, nasty, hard to ride, and nearly unmanageable in all but the most expert hands. According to someone who ought to know, it was overweight, it didn’t steer, and no matter how well set up the suspension was, it wobbled like a shopping cart with a bent wheel. Roberts and a 1977-vintage TZ750 owned by Yamaha racing director Ken Clark, along with two-time AMA Superbike champ Wes Cooley and his 1980 title-winning Yoshimura GS1000 Suzuki Superbike owned by Craig Vetter, had been invited to Willow Springs Raceway in Rosamond, California, to take part in one of Cycle Guide’s high-concept feature stories, this one comparing the TZ and the GS with their approximate street-going counterparts, the FZ750 and GSX-R750. The general idea was to inflate the egos of sportbike riders by showing them how like actual race motorcycles their streetbikes were. A flimsy premise, yes, but it got us two days at Willow, and the opportunity to ride two legendary racebikes. I wrote the story in Cycle Guide, and was so busy taking notes that I remember only a little bit of what went on during those two days. I remember catching editor Jim Miller going into a slow left-hander, diving inside him, and whacking the throttle on the Yosh Suzuki as I passed him. Later he said the sound that erupted from the open megaphone nearly blasted him out of the saddle of the GSX-R750. 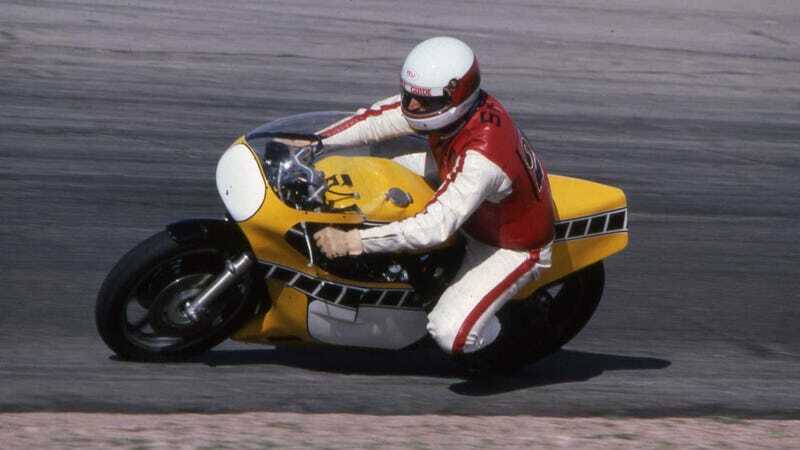 I remember sitting on the dusty floor of a bare room under the timing tower—there was no furniture, not even chairs—interviewing Roberts about the TZ750, his racing career, and anything else that came to mind. I probably asked him what his favorite color was—when you get a guy like KR to sit down for a Q&A, you milk it for all you can. But the thing I remember most is walking up to that TZ750, pulling in the clutch, thumbing the choke lever, toeing the gear lever down into second, pushing the bike down the pit lane, dropping the clutch, and hearing the dry clutch rattle and the engine burble for a few seconds before it lit up with a deafening staccato shriek that shot an entire day’s supply of adrenalin through me in a second. I’d raced a 1974 TZ250 about a decade earlier, and the TZ750 was not so far removed from it that everything was unfamiliar—the hard rubber grips, the reversed shift pattern, the bark of the muffled expansion chambers all triggered long-buried sense memories. But after I’d put a cautious warm-up lap under my belt and twisted the grip all the way for the first time as I hit the main straight, it was like nothing I’d ever experienced before or since. The bike was geared for Daytona or some other high-speed track; at Willow it topped out in fourth by the time turn one came up, with fifth and sixth unusable. It still tripped the radar gun at nearly 150 mph. When I hit the brakes the bike stopped right now, about 50 yards sooner than I’d expected. As I built up speed I braked later and later, and every time, the TZ stopped so hard my eyeballs flattened against the inside of my faceshield. In the corners it felt like it was on rails, and changed direction so quickly and easily I couldn’t reconcile it with what Roberts had been saying about it only an hour before. The power was astonishing; the engine came on the ports with the suddenness of a punch in the face. No hesitation, no lean spot as it made the transition; below the powerband there was decent power, then in the blink of an eye there was holyshiiiit-loads of power. Exhilarating is too weak a word to describe the sensation of riding it. It was awesome. Back in the pits I babbled on about how fast it was and how easy it was to ride—until Dain Gingerelli pointed out that I hadn’t been riding it at anywhere near a race pace. He was right, of course. I’d been going as fast as I’d dared on someone else’s rare and expensive race bike, but the more I thought about it, the happier I was that I hadn’t simply embarrassed myself by fouling a plug, or my leathers. Later that day I got to watch Roberts on the TZ. He hadn’t ridden one in years—he’d only ever ridden this one once, five years earlier—but despite that, and the fact that there was nothing at stake but a magazine story he’d probably never read anyway, he flew around Willow like a man possessed. I got to ride one legend that day, and see another put on a show. Not bad, even if I never got going fast enough to get the TZ’s attention. Jerry Smith has been a freelance writer for…well, a very long time. When he’s not writing about motorcycles, cars, RVs, or dogs, he makes up stories about people who don’t exist. His latest book, Missed Shifts, spans a career riding fast bikes and covering the motorcycle industry. You can get it on Amazon here.